Every year we dump tons of waste – this source says up to 2.12 billion tons. Of this, plastics account for 10% – 16% of the total waste. Even though the use of plastic is essential in several industries, the problem posed by the waste accumulated cannot be ignored. According to Plastic Oceans, plastic pollution is even worse than we think it is. Half of the 300 million tons of plastic we’re producing is designed for single use, and each year around 8 million tons of it ends up in our oceans. While a mutant enzyme has been discovered to eat plastic, it is far from solving our plastic problems, and we do not yet know the long-term effects. To curb the increase of humans’ marine litter, the European Commission has proposed a new law that bans the top-10 culprits of single use plastic products, ranging from cutlery, plates and straws to water bottles and food containers. On an individual scale, you can also do your part to combat plastic pollution. Here are three quick and easy tips to lessen the use of plastic in your day-to-day activities. Fifty percent of the plastic we use, we use just once before throwing it away. We need to start thinking more sustainably – rather than opening yet another plastic bottle of water, why not refill your glass of water? Can you imagine the bottles of water you wouldn’t have to buy if you invested in a filter for the tap or a BRITA jug? After realising that these little changes amount to something, your revolutionary act of reducing means one less plastic bottle in the ocean, one less plastic straw to worry about. Little as that may seem, it means something. Several cities around the world are championing this cause through awareness campaigns and clean-up measures. The state of California banned plastic shopping bags in 2016; Spain has launched an awareness campaign ‘Desnuda la fruta’, to reduce (and hopefully eliminate) the use of single use plastic in the packaging of fruits; plastic-free grocery stores are springing up in the U.K., Cape Town and Amsterdam, amongst others; and Kenya currently has the toughest plastic bag ban in the world with offenders facing up to four years in jail! Choose to reuse when it comes to shopping bags and plastic bottles. At LGI, we try to refuse bags offered at the restaurants when we go to fetch our lunches, reusing the shopping bags we already have. Give this a try and you’ll see that refusing single-serve packaging is often not as difficult as you think it’d be. Cloth bags and reusable bottles are also a fave at the LGI HQ. Vincent’s Bento box is also a good indication that we’re leading by example for this cause! We’re surrounded by plastic! The keyboards on our laptops? Plastic! Our headphones? Plastic! The frames on your eyeglasses? Plastic! Even our nails for those who love a good French tip! So if you must use plastic, try to choose #1 (PETE) or #2 (HDPE), which are the most commonly recycled plastics. Indeed, plastic plays an essential role in several industries such as building & construction, automotive, electrical & electronic. However, its use in packaging could be curtailed little by little to reduce the negative reality of our plastic use (the oceans brimming with plastic waste and its impact on aquatic creatures, amongst others). 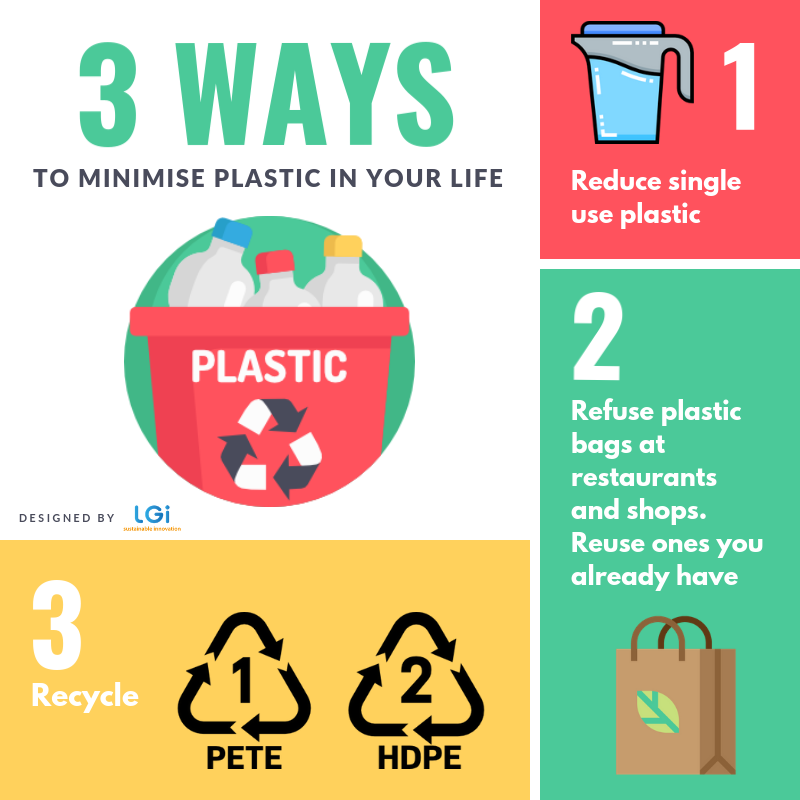 You may not be able to build to plastic roads, turn plastic waste into innovation, create floating parks like they have in the Netherlands, or come up with a creative way to repurpose plastic waste around you, but you can surely start by applying these 3 tips – if not all at once, one at a time!